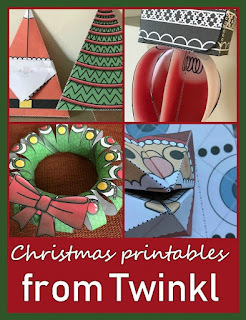 If you need some fun and simple ways to decorate your home this Christmas, Twinkl Resources have a huge range of full colour printables which you can print and assemble for some easy Christmas crafting. Today I'm sharing a few of my favourites! Please note that these printables are all Platinum resources which means that you need a paid subscription to download them. Scroll to the bottom of this post for some links to some free Twinkl Christmas resources! 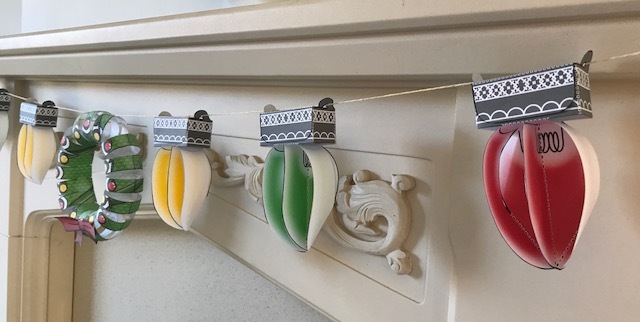 This Simple 3D Christmas Lights Decoration (Twinkl subscriber resource) allows you to make some Christmas lights in three festive colours which can be strung together and used as bunting. Here you can see it across our fireplace, and it would also look great hung down the banisters or across the top of the room. It was super easy to put together and looks really effective! In the middle I have hung a 3D Christmas Wreath Display Printable (Twinkl subscriber resource). Once again, this printable was really easy to assemble and makes a great little Christmas decoration. The children had a lot of fun making and playing with these 3D Christmas Fortune Tellers (Twinkl subscriber resource). They don't have any complicated cutting or folding, so even little ones can put them together once they've been shown how to, and they are great for Christmas role play or just to use as a decoration. Finally I had a go at some Christmas Origami Paper Crafts (Twinkl subscriber resource). 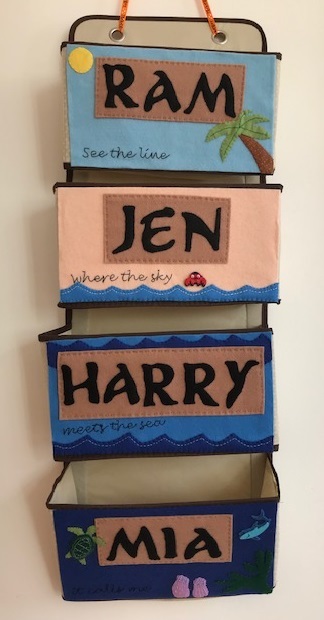 There are lots of different designs to choose from, and they vary in complexity, so you can choose the design most suitable for the children or adults that you are working with. The finished pieces are very sweet and look lovely on display. You could also punch holes in the top and use them to decorate the tree, or embellish them further with glitter and sequins. If you want to try out Twinkl for free to see if a subscription is right for you, there are also lots of free resources available to download. For example, you can find some fab Christmas themed printables here - Free Twinkl Christmas Resources. I have also previously shared some more Printable Christmas Decorations from Twinkl which includes crafts using both Platinum and free resources. I have been provided with a Platinum Subscription to Twinkl in exchange for sharing their resources across social media.